FAST-SWITCH POWER-LOCK HITCH (not belts) Drive shaft delivers power directly from power-take-off (PTO) to attachment --- front, rear and center-mounted. And switching powered attachments takes only a few minutes. TRUE COMPACT TRANSAXLE Geared transmission is in unit the differential. Delivers more power to the wheels. You turn shorter, maneuver more easily. FOR FREE WHEELING (circle) pull pin out. TUBULAR FRAME Comparable to type used in racing cars. Prevents twisting and increases rigidity. Heavy-duty frame casting assures better tractor balance. EASY STEERING Heavy-duty front suspension has inclined king-pings for easy steering safe operation over rough ground. Cast-iron front axle is center-pivoted so wheels follow ground contours. SAFETY CLUTCH Lets you stop and start attchments from the tractor seat. 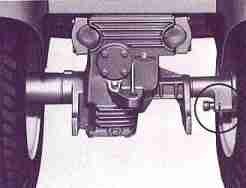 Lever is located beneath steering wheel --- locks in "On" or "Off" position. PLATE CLUTCH DRIVE Double-plate, automotive-type clutch engages smootly, assures positive power from engine to transmission. CONVENIENT CONTROLS All operating controls are located within fingertip reach of operator for ease and safety. Shift gears, change speed ranges (Husky 850 and 1050) and adjust differential (Husky 850 and 1050) without leaving the tractor seat. Without slowing or stopping the tractor, you can start, stop, raise or lower attachments. 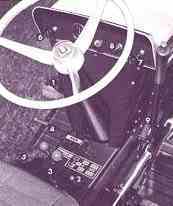 ONE-PEDAL CLUTCH AND BRAKE Shift into gear and release foot pedal for smooth, even power to wheels. Depress pedal part way for clutch, all the way for brake. Large foot rests are ribbed to prevent slipping. 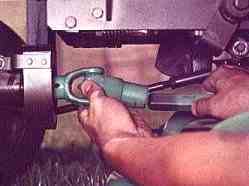 ATTACHMENT LIFT LEVER Raises and lower all attachments while under full power. Locks attachments is any 6 positions. PTO drive eliminates need for belts --- no re-anlignment needed to operate at various heights.